Assessment: Candidates will be expected to complete a two-hour examination after the third day of the course. Absolutely anyone working on wiring installations in domestic, commercial and industrial properties must adhere to the requirements of the IET Wiring Regulations (Amendment 3: 2015). The City and Guilds 2382-15 course is designed to give learners the necessary knowledge to work confidently and safely in accordance with these regulations. This course is theory-based – those attending will study the Wiring Regs and our tutors will explain in detail the requirements placed upon you. It also covers Part 2 Definitions, ‘Cmin’ Factor and Condition Reports. This course is suitable for anyone, even if you don’t have the previous electrical background. Working knowledge of basic electricity would be an advantage but isn’t essential as our tutors will make sure everything is explained clearly. We recommend that you take this course either as a stepping stone towards other courses or take this to make sure you’re up-to-date with the requirements of Amendment 3 of the IET Wiring Regulations. The 17th Edition course is the basic standard qualification for almost all aspects of any electrical career and is necessary for anyone serious about a career in electrics. Once completed, this Stockton 17th Edition course allows candidates who successfully pass to move on to further higher level courses such as becoming an Electrical Installer, Qualified Supervisor or becoming certified to carry out Inspection and Testing. All candidates should buy, read and bring a copy of the IET Wiring Regulations (including Amendment 3). If you don’t have a copy of the book, you can buy one from us directly from our test equipment website. Just follow this link. This course covers all of the changes made under Amendment 3 of the IET Wiring Regulations and gains you a full City and Guilds qualification. Ideal for those in Teesside, Middlesbrough, Sunderland, Durham, Newcastle and other areas around the North East, our 17th edition course Stockton ensures you get the qualification you need to work to the requirements of the IET’s Wiring Regulations. As of July 2015, this course became mandatory, replacing previous versions of the 17th edition course. This new course – 2382-15 – reflects the changes made under Amendment 3 of the IET Wiring Regulations (2015)*. This course takes place in our dedicated electrical training centre at Stockton-On-Tees and is regularly ran throughout the year. 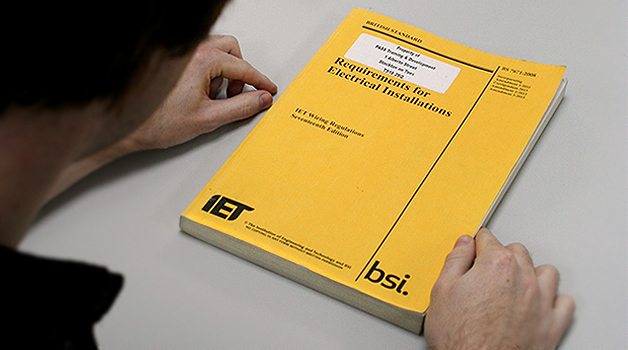 We recommend that candidates purchase, read and bring with them a copy of the IET Wiring Regulations (Amendment 3). If you don’t have a copy, you can buy one directly from our test equipment website by following this link. *Note: If you already have an existing 17th edition qualification, you need to attend another training course to update yourself to Amendment 3 standards. We run regular 1 day workshops for those with prior experience – please call us for more information.